The teeth of the great demon Vala, scattered throughout the celestial regions, fell like stars into the oceans below and became seeds for a species of gems with the luster of full moon beams. Entering into the shells of oysters lying within the ocean depths, these seeds became pearls. Oyster pearls found along the coasts of Sri Lanka, Bengal, and Persia, Indonesia and other lands located in the Southern Hemisphere are superior in shape, color, size, ad other qualities to those from other countries. Besides oyster pearls there are seven other types found in conch shells, wild boars' heads, elephant heads, king cobra's heads, bamboo stems, clouds, and fish heads. Pearls from elephant heads, bamboo stems, boar heads, fish mouths, and conch shells are lusterless, even though possessed of other auspicious qualities. Pearls from conch shells are usually the size of a large kona (the large and of a drum stick), and they possess a color similar to their host shell. Fish pearls are perfectly round and symmetrical. They possess a yellowish hue like the scales of the pathenam fish which often inhabit the mouths of deep sea whales. Boar pearls are colored like a boar's tusks and are found only in remote parts of the world. Such pearls are auspicious symbols of the Varaha board incarnation of the Supreme Lord, Sri Vishnu. Pearls derived from bamboo appear like hail stones in color, and they are found only within bamboo that has grown in a region populated by religious people. Pearls from the cobra's hood are perfectly round, like fish pearls, and they radiate a natural effulgence. By repeated washing, a snake pearl becomes as lustrous as a polished sword blade. Anyone possessing such a naga-mani attains piety, rare good fortune, and eventually becomes illustrious as a leader of men, complete with a great collection of all precious gems. Upon acquiring such a snake pearl, the owner should have the rite of installation performed by a priest who is learned in religious formalities. After hearing from the owner how the pearl was obtained and conducting the benedictory ritual, the priest should formally install the jewel inside the owner's house. On such an auspicious occasion, the sky becomes filled with dark and heavy rain clouds, thunder, and flashing lightning, such as exhibited at the time of universal dissolution. A man in possession of such a snake pearl will never be troubled by snakes, demonic beings diseases, or disturbances in any form. Cloud pearls, being naturally effulgent like the sun, illuminate the sky in all directions and dispel the darkness of cloudy days. Glowing brighter than the combined light of the moon, the twinkling stars, and fire, a cloud-born pearl dissipates even the darkest night exactly like the sunrise. A cloud pearl is so priceless that the entire earth, with here oceans filled with countless jewels and covered in layers of gold, would not be equal in value. Cloud pearls rarely reach this earthly world, because they are usually taken away by the demigods. Even a low born man would become supreme ruler of the entire world if, as result of some past pious actions, he were to come into possession of such a pearl. The appearance of such a man on earth who obtained a cloud pearl during his lifetime would bring good fortune not only to himself, but to the entire human race as well. No form of evil could even touch the land within an 8,000 mile radius of his birthplace. An expert gemologist should appraise pearls according to their size, shape, and other qualities, rather than their place of origin. Oyster pearls are the only type capable of being drilled through their centers. This is the method used for drilling pearls: First, the pearls should be mixed in bowl of rice previously soaked in lime juice. After simmering for some time on low heat, the pearls should be removed and rubbed with cool boiled rice water. After soaking, they should be pierced through the center. To clean pearls they should be kept in a covered clay container and lightly boiled in either milk, water, or wine. Thereafter, they should be carefully rubbed in a peace of pure linen cloth until they regain their natural luster. This process of cleaning pearls was taught by the great Vyadhi (Vyadhi was, according to the Sanskrit dictionary of V.S. Apte, a celebrated grammarian. Vyadhisa is a name for Lord Vishnu, most probably His Dhanvantari incarnation, in which form the Lord revealed the medical science to mankind. This latter meaning seems more suitable to this verse), out of his compassion for the learned and virtuous. Pearls worn by either kings or men of noble rank should be kept in a glass container, soaking in a solution of mercury and gold. 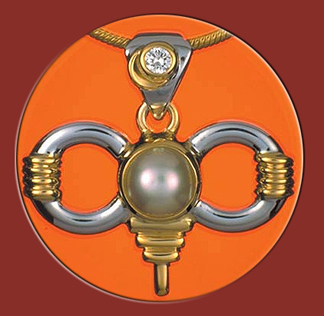 This is the process followed by pearl experts in Sri Lanka. The test for a genuine pearl is to soak the specimen overnight in a mixture of warm oil and salt. The natural pearl will remain unaffected. Another test is to rub the specimen pearl with a peace of dry cotton cloth and rice. A genuine pearl will no lose its color or luster in any way. A pearl of the highest quality should be white, translucent, round in shape, lustrous, and of good weight and size. A large, round white pearl with effulgent luster and with a clean, even hole drilled through its center, which charms even a person who is not even interested in pearls, should be considered as possessed of a rare, good quality. The owner of such a pearl will never suffer any form of ill fortune.